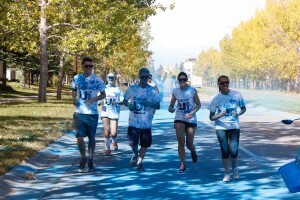 The fourth annual Colour-U-Blue was a blast of colour, fun and athleticism. This year’s Colour-U-Blue put on by Mount Royal Recreation in collaboration with Cougar Athletics was the best one yet. For the first time ever Calgary’s original colour run sold out with 525 registered participants. This was Jessica Whites first time doing the run. “It seemed like a good way to fit into the university, meet people and have fun,” says White. The atmosphere was electric right from the registration booth as over 80 volunteers were eager to greet you as they danced along to the live music that DJ’s were spinning on site. The participants started to get pumped up as they designed their white t-shirts and adorned their new sunglasses the sun began to shine down over Mount Royal University’s pond and the course of the 4 km run. Teams and individual runners were encouraged to dress up to promote unity and get participants involved in a costume contest. Sandy Tran studies business at MRU and loves a good contest. After winning the VIP Instagram contest from MRU Recreation, which included free entry for her and five friends, six prize packs with a bag, water bottle and towel she wanted to keep the momentum going. “We dressed up for pride so we thought we’d dress up again for Color-U-Blue,” says Tran. Tran and her blue crew prepared their costumes the night before and then sported some creative blue and green balloons that resembled a rather fast porcupine as they ran the course. With over 500 litres of liquid paint and over 2,000, 100g packages of powdered paint in sight, the participants were ready to take off and make it to the finish line where they would get dyed blue from their runners to sunnies.